They say a writer’s work is never finished and in theory they may be right. With every new draft or read-through comes another irresistible opportunity to tinker with a phrase, tweak the scene order, remove a character altogether or insert a whole new passage that opens up a world of possibilities. But at the same time, there’s a fine line between something that’s been edited well and over-written as both readers and writers are painfully aware. With the blending of words on a page and a camera, film scripts -- when performed -- play like notes on a page and a piano. Film, like music can be mellifluous in language, harmonious in editing and dissonant in direction, depending upon how heavily it’s performed by the person playing the keys. And unfortunately, there’s little rhythm – let alone discernible music in the directorial debut of Keanu Reeves as five long years of tinkering with the composition of Michael G. Cooney’s script has resulted in something that feels as wooden as a grand piano but with none of the power or impact. From the constant changes in tempo that never quite evolve into sequences which hold us in their sway to the scarce yet staccato-like lines of dialogue that strike an all too familiar chord, we’re presented with something we’ve experienced many times before – executed at a much greater level in other "Once Upon a Time in Asia" martial arts opuses of heroes and villains. While Reeves’ aim is undoubtedly true in a work that derived inspiration from a stuntman friend of the actor’s – Tiger Chen (who plays a fictionalized version of himself) – the film never manages to invest the audience in the storyline on any level. 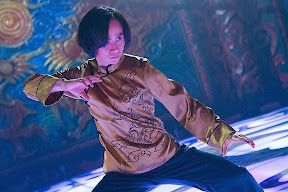 Emotionally icy, Man of Tai Chi keeps viewers as removed from the action as the villainous businessman that Keanu Reeves embodies onscreen who often appears seated in front of a television – a spectator in his own right– looking down on the gladiators he’s hired who fight for him and live or die for his amusement alone. Yet far from a comment on voyeurism, the script begins traditionally enough, presenting itself like a standard genre thriller that John Woo would’ve gravitated to in the late ‘80s as a vehicle for Chow Yun-Fat in its tale of a man “on the inside” who gains access to villains and feeds information to his fellow officers. However, it never follows through on its intriguing introduction to a female police officer whose informant has been placed in harm’s way while trying to find out the true nature of businessman Reeves’ role in the underground fight scene. Relegating its police story to mere subplot, Cooney’s decision to ignore the typical genre paradigm would’ve been much more exciting had he built up a compelling enough storyline to take its place but he has nothing to offer viewers that we haven't seen before. He opts for simplicity instead, letting events unfold slowly but with all the surprise of beer commercial. 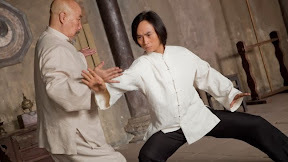 While simplicity can be refreshing, in Cooney and Reeves’s hands it does its star a disservice, leaving it up to Chen – or to be more accurate the physicality of his fights choreographed by Matrix and Crouching Tiger craftsman Yuen Woo-ping – to entertain us for its 105 minute running time. A throwback to Bruce Lee films of the 1970s, Man of Tai Chi relies on character based action from start to finish. A true underdog in the Rocky tradition that easily endears him to the audience, Chen, who works as a Beijing deliveryman, is as dedicated to his master as he is his own parents, working with the elder on his own fusion of Tai Chi with fight style martial arts. 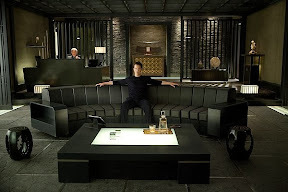 Lured into Reeves’ lair by the vague promise of a job, Chen is placed in a windowless room and pushed to fight (unknowingly for the cameras) in a brutal defensive audition as opposed to a formal interview. Having easily beaten his opponent and impressed the voyeuristic villain looking for a new gladiator, Chen finds himself caught between two very different worlds as he begins to realize what’s really going on behind the spectacle of televised fights staged by Reeves. 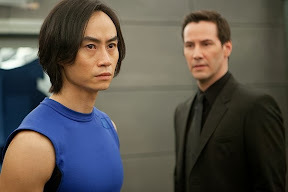 Unfortunately as likable as Tiger Chen is in the film, Reeves leaves us all revved up by Chen’s talent with nowhere for the actor (and character) to go except through its paint-by-numbers plot points until a final confrontation brings our hero face to face and fist to fist with Reeves’ villain. With everyone and everything else onscreen relegated to window dressing, Man’s flaws become even greater once you strip away the external and focus on the foundation itself, which is fairly easy to do in the film’s forgettable second half where there’s little else to hold our interest after the novelty of the great fight sequences begin to wear off. Though an obvious must-see for fight fans as even in one of Yuen Woo-ping’s lesser offerings like The Forbidden Kingdom, the action choreographer’s creativity under pressure manages to elevate even the weakest of works, unfortunately there’s little left to recommend Man on any other level. Perhaps most disturbingly as a fan of Reeves in other films, it’s painful to admit that one of the biggest problems in Reeves’ directorial debut is Reeves himself. Whether his shockingly bad turn is proof that he benefits from collaboration and does his best work under another’s direction or evidence of the tremendous stress he was under and was unable to switch off all over the other hats he was wearing during production is anyone’s guess. Likewise, while it’s hard to imagine that he actually intended to turn in such an unbelievably campy performance (because then we'd be facing a much greater problem of taste) -- ultimately in what he essentially fashioned as a two-handed work in its simplicity, it’s his hand that drops the ball passed to him by Chen. Uttering Cooney’s clichéd lines like a comic book character in need of a thought bubble or caption while occupying his space onscreen compulsively clad in “bad guy black,” the only thing missing from Reeves is a mustache to twirl or a white cat to pet to complete the full “I’ll get you next time, Gadget,” Saturday morning cartoon effect. 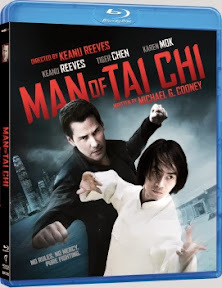 Given a stunning transfer to high definition Blu-ray with DTS-HD 5.1 surround sound, the Blu-ray which boasts Reeves and Chen feature commentary is light on bonus features, save for one single behind-the-scenes inclusion on “The Making of Man of Tai Chi. 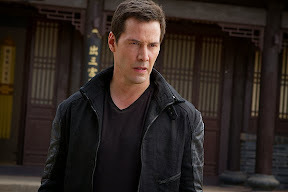 Particularly inadequate when compared to the other Ping efforts, Keanu Reeves’s labor of love, which was labored over far too long in the script process is also a labor to view. Likewise, being released around the same time as vastly superior films which focus on the man who trained Bruce Lee makes Man’s simplistic approach as a film that may have been ideal fodder for Bruce Lee if made forty years earlier even more disappointing by comparison. Moving from its initial, simple melody into something wooden and off-key, Reeves and Cooney take what could’ve been a classic throwback to Bruce Lee and serve up chaotic Tai Chi cacophony until eventually we see beyond what it is and instead what it should be.